Tags: Asia, Ceylon, Sri Lanka. Antique Map Ceylon by Renneville titled ‘ZELON’ (Ceylon ~ Sri Lanka). 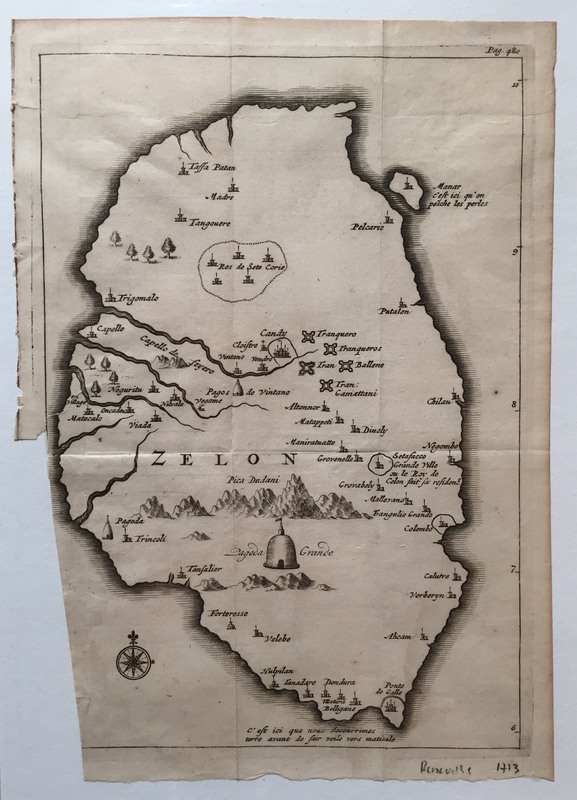 An early 18th century black and white French map of Ceylon (Zelon), modern-day Sri Lanka by the French writer, Rene Augustin Constantine de Renneville who was imprisoned in the Bastille between 1702-1713 and while there translated Issac Commelin’s Dutch travel accounts as Receuil des Voyages … Des Indes Orientales …and published by Estienne Roger between 1702-06 in Amsterdam in 7 volumes. This map of Ceylon was published in the second volume (Tome second) in 1703 and shows the Grand Pagoda, the settlements and fortifications and the places where pearls may be collected.